The Palmachim Airbase (Hebrew: בָּסִיס חֵיל-הַאֲוִויר פַּלְמַחִים‎) is an Israeli military facility and spaceport located near the cities of Rishon LeZion and Yavne on the Mediterranean coast. It is named after nearby Kibbutz Palmachim. The base is home to several IAF helicopter and UAV squadrons, and serves as a rocket launch site for the Arrow missile. Palmachim is also used to launch the Shavit space launch vehicle into retrograde orbit by launching over the Mediterranean, acting as Israel's primary spaceport. The launchpad is situated at 31°53′04″N 34°40′49″E﻿ / ﻿31.88444°N 34.68028°E﻿ / 31.88444; 34.68028﻿ (Shavit launchpad) This ensures that rocket debris falls into water, and that the rocket does not fire over regional neighboring countries near Israel that could use the technology. Palmachim is also used to test ballistic missiles, such as the Jericho. In July 2007, it was agreed that once Sde Dov Airport in Tel Aviv was closed, its military terminal would be transferred to Palmachim although Sde Dov Airport continues to operate. On 17 January 2008 Israel test fired a multi-stage ballistic missile believed to be of the Jericho III type, reportedly capable of carrying "conventional or non conventional warheads." 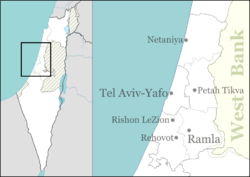 On 2 November 2011, Israel successfully test fired a missile believed to be an upgraded version of the Jericho III; the long trail of smoke was seen throughout central Israel. ^ "U.S./Israel Complete Successful Arrow Missile Defense Test". GlobalSecurity.org. ^ a b Azoulay, Yuval (18 January 2008). "Missile test 'will improve deterrence'". Haaretz. Retrieved 5 January 2012. ^ a b Pfeffer, Anshel (2 November 2011). "IDF test-fires ballistic missile in central Israel". Haaretz. Retrieved 3 November 2011. ^ "Israel launches Ofek 10 radar-based spy satellite". jpost. Retrieved 10 April 2014. ^ "Israel launches Ofek 11 surveillance satellite". ^ Surkes, Sue (29 May 2017). "Israel launches propulsion rocket in early morning test". Times of Israel. Retrieved 2 September 2017. ^ "Tel Aviv airport to make way for luxury project". Retrieved 2007-07-03. ^ "Shavit (Israel), Space launch vehicles - Orbital". Jane's Information Group. 2009-04-21. Retrieved 2010-04-17. ^ Greenberg, Hanan (22 June 2010). "Israel launches spy satellite". Ynet.com. Retrieved 22 June 2010. Wikimedia Commons has media related to Palmachim IAF base. This page was last edited on 1 February 2019, at 18:13 (UTC).